For thousands of years, humans around the world have recognized the tremendous healing properties of a legendary herb - Nigella Sativa, or Black Seed Oil. We now realise that the complex synergy of over 100 natural chemicals contained in Black Seed Oil, work together to enhance and strengthen the body's immune system in a way no other singular, naturally occurring substance has ever been known to do. Tends to improve the efficiency of all organs and systems of the body, including the functioning of the liver, kidneys immune system and digestion. "This humble, but immensely powerful seed, kills MRSA, heals the chemical weapon poisoned body, stimulates regeneration of the dying beta cells within the diabetic's pancreas, and yet too few even know it exists,"
Asthmaa: Thymoquinone, one of the main active constituents within Nigella sativa, is superior to the drug fluticasone in an animal model of asthma. [vi] Another study, this time in human subjects, found that boiled water extracts of black seed have relatively potent antiasthmatic effect on asthmatic airways. Since these were published, the biomedical research on black seed has continued to flourish, with another 78 studies published and cited on the National Library of Medicine's biomedical database MEDLINE over the past 11 months. Prevents Radiation Damage: Nigella sativa oil (NSO) and its active component, thymoquinone, protect brain tissue from radiation-induced nitrosative stress. Protects Against Damage from Heart Attack: A thymoquinone extract from nigella sativa has a protective effect against damage associated with experimental heart attack. Prevents Morphine Dependence/Toxicity: An alcohol extract of nigella sativa reduces morphine-associated conditioned place preference, an indication of morphine intoxication, dependence and tolerance. Prevents Kidney Damage Associated with Diabetes: A thymoquinone extract from nigella sativa has protective effects on experimental diabetic nephropathy. Prevents Post-Surgical Adhesions: Covering peritoneal surfaces with Nigella sativa oil (NSO) after peritoneal trauma is effective in decreasing peritoneal adhesion formation in an experimental model. Prevents Alzheimer's Associated Neurotoxicity: A thymoquinone extract from nigella sativa has protective effects on experimental diabetic prevents neurotoxicity and Aß1-40-induced apoptosis in the cell model. Suppresses Breast Cancer Growth: : A thymoquinone extract from nigella sativa inhibits tumor growth and induces programmed cell death (apoptosis) in a breast cancer xenograft mouse model. Exhibits Anti-Psoriasis Properties: The alcohol extract of nigella sativa seeds exhibit anti-psoriatic activity, consistent with its medicinal use in traditional medicine. Prevents Brain Pathology Associated with Parkinson's Disease: A thymoquinone extract from nigella sativa protects cultured neurons against aSN-induced synaptic toxicity, a pathology observed in the brains of patients with Parkinson's disease and dementia with Lewy bodies. Kills Highly Aggressive Gliobastoma Brain Cancer Cells: A thymoquinone extract from nigella sativa exhibits glioblastoma cell killing activity. Kills Leukemia Cells: A thymoquinone from nigella sativa induces mitochondria-mediated apoptosis in acute lymphoblastic leukaemia in vitro. Suppresses Liver Cancer Growth: A thymoquinone extract from nigella sativa prevents chemically-induced cancer in a rat model. Prevents Diabetic Pathologies: A water and alcohol extract of nigella sativa at low doses has a blood-sugar lowering effect and ameliorative effect on regeneration of pancreatic islets, indicating its value as a therapeutic agent in the management of diabetes mellitus. Suppresses Cervical Cancer Cell Growth: A thymoquinone extract from nigella sativa exhibits anti-proliferative, apoptotic and anti-invasive properties in a cervical cancer cell line. Prevents Lead-Induced Brain Damage: A thymoquinone extract from nigella sativa ameliorates lead-induced brain damage in Sprague Dawley rats. Kills Oral Cancer Cells: A thymoquinone extract from nigella sativa induces programmed cell death (apoptosis) in oral cancer cells. Why is such a powerful seed not yet on the radar of most medical and nutrition communities? We know sesame seed can beat Tylenol in reducing arthritis pain and can reduce cardiovascular disease risk factors in a manner that makes statin drugs envious, and we know flaxseeds shrink breast and prostate tumors, but black seed's benefits are still largely under reported and underutilized. Interestingly, despite this blind spot, and as if to confirm black seed's immense potential as a healing agent, Nestlé, the Switzerland-based global food giant, filed a patent on the use of nigella sativa to "prevent food allergies" in 2010 (Nestlé's international patent publication WO2010133574). This obvious attempt to appropriate traditional knowledge and use claimed the plant seed or extract should be Nestlé's intellectual property when used as a food ingredient or drug. According to a Third World Network Briefing Paper from July, 2012: "The Swiss giant's claims appear invalid, as traditional uses of Nigella sativa clearly anticipate Nestlé's patent application, and developing country scholarship has already validated these traditional uses and further described, in contemporary scientific terms, the very medicinal properties of black seed that Nestlé seeks to claim as its own "invention". Sayer Ji: on the Board of Governors for the National Health Federation, and Fearless Parent, Steering Committee. Member of the Global GMO Free Coalition (GGFC), a reviewer at the International Journal of Human Nutrition and Functional Medicine. Please click on the further reading tab for more information. 100% pure, cold pressed from the highest quality seeds. Vegan. GMO, solvent & additive free. Sensitive individuals: 3ml every other day for the first few weeks, then daily. Children: Smaller amounts, proportionate to body weight (Adult amount based on 12st/ 76kg body weight). It is generally advisable to start at one domestic teaspoon daily and build up slowly to find your upper suitable limit. Up to one dessertspoon a day may be taken in times of need. The oil may be swallowed neat, or blended with juice. do not heat. Typical use: Periodic courses of a few months. 100% pure, cold pressed, GMO, solvent & additive free and comes from the highest quality seeds. For thousands of years, humans around the world have recognized the tremendous healing properties of a legendary herb - Nigella Sativa, or Black Seed. "Black Seed heals every disease except for death." The Prophet Mohammed proclaimed over fourteen hundred years ago. It's quite a statement; but.. 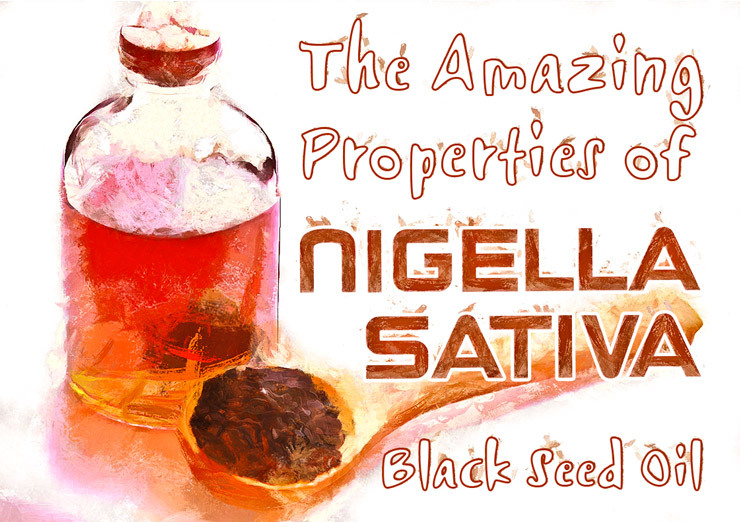 The protective and healing powers of Black Seed, the seeds from the plant Nigella Sativa, are so astoundingly comprehensive and varied that for thousands of years humans have regarded it as a "Miracle Cure". Black Seed has an unprecedented strengthening effect upon the immune system, and works in a host of other ways to promote optimum health and well being. It works by assisting the body in its own natural healing processes. This remarkable herb has a legendary status and has had a recent resurgence in Western medicine. Its efficacy is solidly backed by three thousand years of folklore and the past fifty years have seen a burgeoning amount of scientific data to further support Black Seed's renowned healing properties. 'We now realize that a complex synergy of over 100 chemicals contained in Black Seed work together to enhance and strengthen the body's immune system in a way no other singular, naturally occurring substance has ever been known to do'. The very fact that Black Seed targets the vital workings of the immune system grants it power over a wide range of ailments, both as a treatment and preventative. Consequently, Black Seed has proved itself a forceful ally against many ailments, such as those caused by bacteria, viruses, and common allergies. It has also proved valuable against such fatal diseases as cancer and AIDS. When it comes to health and well-being, a strong immune system is vital, and the properties of Black Seed are key to regaining the efficient functioning of your immune system and maintaining its optimum effectiveness. Furthermore, Black Seed is a potent, antihistamine, anti-tumour, antibacterial, and anti-inflammatory agent, and the application of these actions alone provides relief for a multitude of ailments and disorders. Black Seed has such diverse powers that, before we examine the specific uses of the herb, let's recap the variety of actions that it provides. Although many more can be listed from centuries of use, the actions that follow have all been verified through scientific research conducted over the last fifty years. In what way does Black Seed Oil, as a broad-spectrum remedy, differ from the other broad-spectrum remedies or superfoods, such as Chlorella, Barley Grass or Pollen? It does not contain such a complete range of nutrients as the super foods mentioned, so falls midway between a herbal remedy and a functional food. 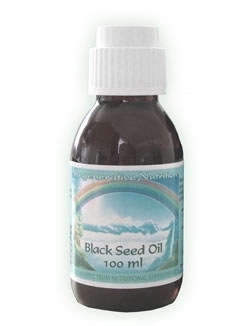 Black Seed Oil has many health benefits. Superfoods can gradually improve the overall health by addressing the problem of cellular malnutrition, the long term basis of all chronic disease. Cellular malnutrition in the first world is due to many factors such as farming methods that deplete the soils essential nutrients, and supply us with 'empty food'. The practice of cooking food denatures and impedes absorption, combined with impaired digestion. Other factors including eating refined foods and a toxic environment. These all contribute to cellular starvation of essential fluids and nutrients. With regular consumption of superfoods we can gradually improve the state of our cellular nutrition, and in turn health will gradually improve, although improvements in vitality can often occur quickly. However, certain organs and systems of the body can remain below par even after a comprehensive nutritional and dietary programme has been in use for many months. In other words there are certain stubborn issues our bodies do not give up easily. For example; liver congestion, an almost universal occurrence, can be quite stubborn. You may choose to use a Liver/Gall Bladder Flush and this can often help. You can also use black seed oil (we cannot guarantee that this will clear out all of your stones and 'mud' in the liver gall bladder region, it depends on many factors, but even with the flush procedure 6 or more flushes may be needed). We have found that after only a few days of using Black Seed Oil it has improved liver function and associated digestive problems. The warming and bitter qualities seem to penetrate into blockages in the body and rapidly instigate normalisation. Two people with toothache were much improved soon after rubbing the oil into the affected gum. It appears to be one of those remedies that are very potent, highly effective, and able to target a wide range of health problems.